"Better take a deep breath before opening this novel—Gomez-Jurado leaves no time for a second one until you finish the last page." 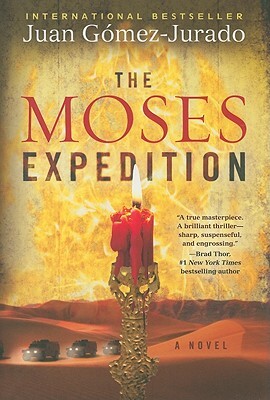 "The Moses Expedition delivers the best of the literary suspense and international intrigue genres with breakneck thrills and twists, and Gomez-Jurado enriches every page with a sophisticated portrayal of characters and a deep respect for history. This fantastic novel will have your brain working overtime and your bedside lamp on into the night." "History, secrets, conspiracies, action, adventure, this is my kind of story. The Moses Expedition is fraught with intrigue and plot twists galore. Juan Gomez-Jurado is a writer who knows how to deliver exactly what readers want. He's in the top echelon of the world's thriller writers and well worth a look. Settle back and savor this perfect piece of entertainment." "A thrilling quest novel by a terrific new talent... this tale is going to cost you some serious sleep." "Nazis, Israelis, archaeologists, terrorists, a reclusive billionaire, a mysterious Vatican priest, hidden treasures, secret maps, the Lost Ark, the Dead Sea Scrolls... A heart-pounding thriller, jam-packed with two thousand years of Middle Eastern intrigue." "A perfectly balanced, fast-paced, and compelling thriller.... Already an international bestseller, it’s also certain to draw the American wing of the still-unsatiated Da Vinci Code crowd."